Magtech has been manufacturing quality ammunition since 1926 and exports products to more than 50 countries, including the United States. Manufacturing all their own components, Magtech has total control over every stage of the production process. The company uses only the highest quality raw materials and state-of-the-art production techniques to produce some of the finest ammunition available to the modern shooter. 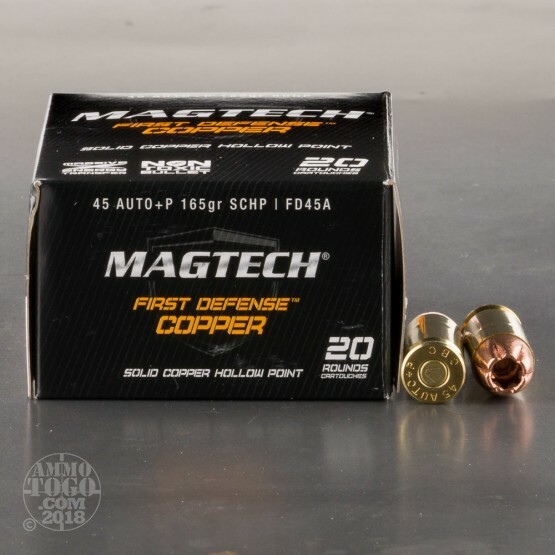 This package contains 20 rounds of Magtech First Defense .45 ACP (Auto) ammunition. Each cartridge is loaded with a 165 grain solid copper hollow point projectile. The solid construction of these high-quality bullets eliminates jacket splitting or tearing, allowing maximum target impact. These rounds also impressive terminal expansion, making them ideal for personal defense and concealed carry ammunition. These new production rounds are non-corrosive, boxer primed, and feature nickel-plated brass cases for smooth and reliable function and feeding. These rounds are loaded to +P internal pressures and produce consistent muzzle velocities of 1100 feet per second and 443 foot pounds of muzzle energy. Depending on the make and model of your handgun, +P ammunition may not be recommended. Be sure to check with the manufacturer for more details concerning use of overpressure ammunition. We fired five rounds of this Magtech 45 ACP (Auto) ammo through a cloth barrier into Clear Ballistics calibrated synthetic gelatin and recorded the results. For these tests, we used a Ruger SR45 with a 4.5-inch barrel. 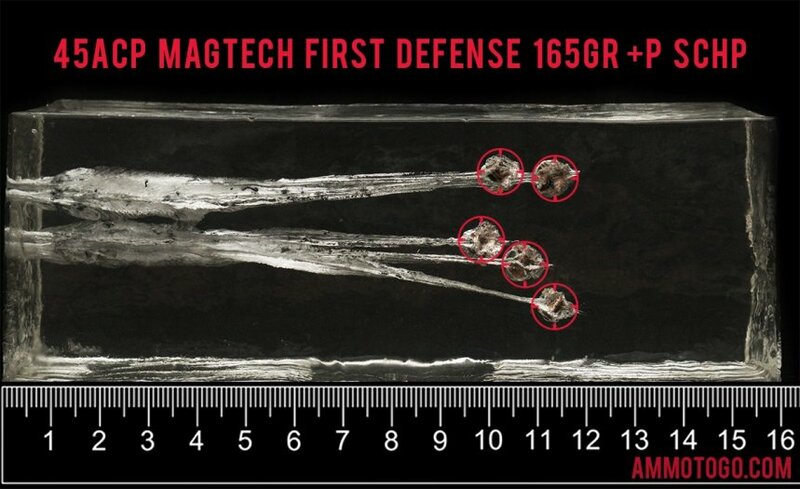 In the photos, graphics and video on this page, you can see specifically how the Magtech ammo performed and how it sticks up with the rest of the 45 ACP (Auto) ammo we have tested so far. How do the results for this Magtech 45 ACP (Auto) compare to other 45 ACP? Expansion Diameter Compared to All 45 ACP (Auto) Ammo Tested MIN 0.45" MEDIAN 0.64" THIS AMMO 0.8" U.S. dime MAX 1.04"
Penetration Depth Compared to 45 ACP (Auto) Tested 0" 10" 20" 30" MIN 8.3" MEDIAN 16.7" THIS AMMO 11" MAX 32"
QUICK VERY QUICK response when I ordered my 4 boxes, less then a week from time of order to receiving the bullets. Everything I received was new and ready to go. This was replacement ammo for the pistols I have set up for self defense. One house pistol Kimber 45 with is setup with flash light and laser. FN FNX45 (15 rounds) for the NOT so good areas total of 46 rounds. Hello fellow premium ammo enthusiasts, I bought 2 boxes of this and some Black Hills 45 tac-xp. The Magtech ammo appears to have thier own Solid copper bullet. Comparing the two, the Black Hills looks much nicer. The nickel cases on the Magtech look fine but the copper bullets look old, with multiple tarnish spots on the bullets. The Barnes bullets appear to be of much higher Quality.